A monument sign is a low to the ground sign that that is either illuminated or constructed from a variety of materials. The materials used to construct a monument sign could be stone, wood, plastic, or various combination of other material. In addition, these signs have a lower overall height and are typically affixed to the ground. They are most commonly used for small businesses, apartment complexes, churches, and schools. A monument sign can be a simple identifier or they can be constructed with very complex information and may even include a marquee or LED message center. A more complex type of monument sign, this stone crafted sign adds a more personal feeling to the entry of a hospice care facility. 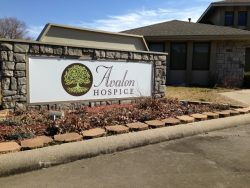 Avalon Hospice, an affiliate of Curo Health Services, chose this type of sign so they could use the marquee message center to promote their company name during the day and to illuminate it in the evening. 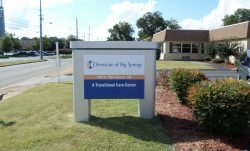 Diversicare of Big Springs in Huntsville, Alabama, a home health care service provider, chose a more simple style for their monument sign. This sign is located directly in the front of their transitional care center. It allows for passersby to quickly locate their business. No matter the type of monument sign you are considering, it will certainly make each of your locations easily identifiable for both existing and potential new customers. If you think this type of sign would be a good fit for your next location or if you have questions about your sign program in general, please contact us to start a conversation. Our team of sign management experts are eager to talk to you about why your company needs a single sign management vendor. Follow Egan Sign on Facebook and LinkedIn for updates on the company and what’s new in the sign industry!